By the afternoon we had followed the coast road back out towards the Atlantic, cycling through Ahakista and passing the stone square towers that dot the coast here. We reach Kilchrohane by 3ish where we had made plans to visit Eleanor – a distant relative of Paddy’s dad who still resides in the house that Paddy’s grandmother was born and grew up. Paddy’s dad has fond memories of summer holiday spent in Kilrohane so we were both keen to visit the house and surrounding area. Eleanor was waiting with her sister and niece for us to arrive and had prepared an amazing array of cakes and scones to have with our tea – it was great to meet them and hear more about the family and the house. 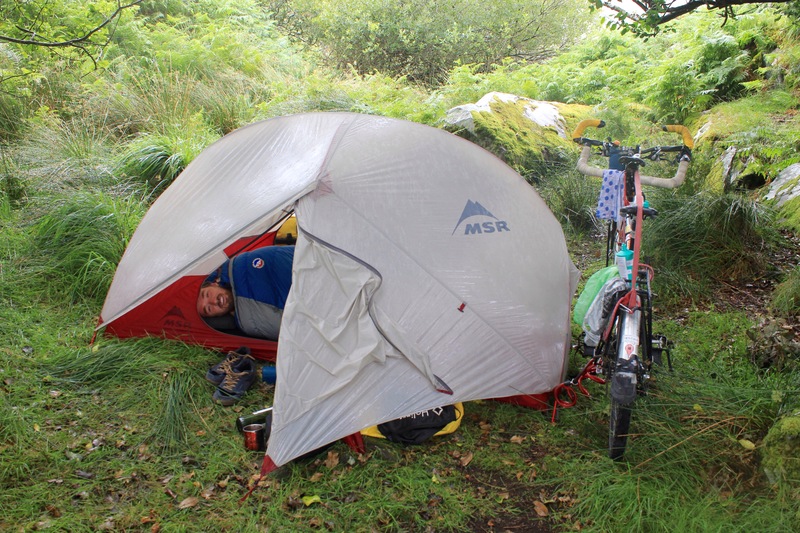 After feasting on all the delicious baked goodies and a quick tour of the bike we said our goodbyes and set off to find a camping spot along the coast. 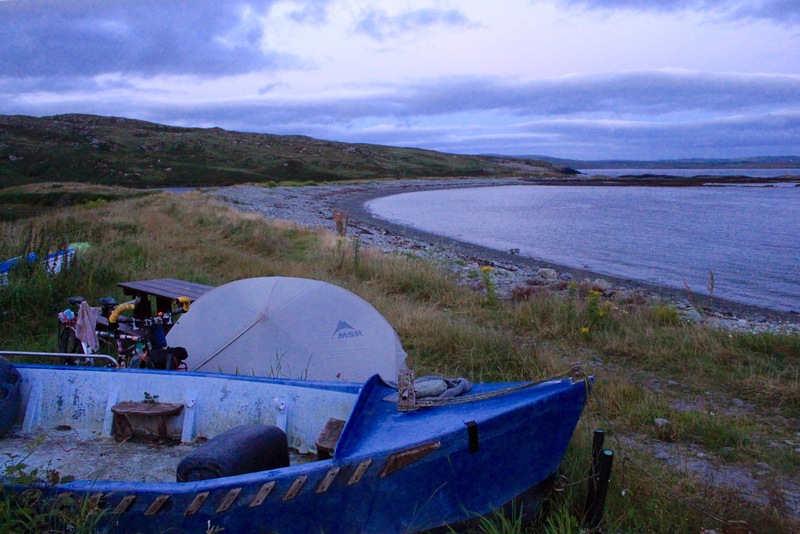 We didn’t need to go far – finding a small track to the left of the main road which led us down to a shingle beach on the pretty inlet south of Khilchrohane itself. 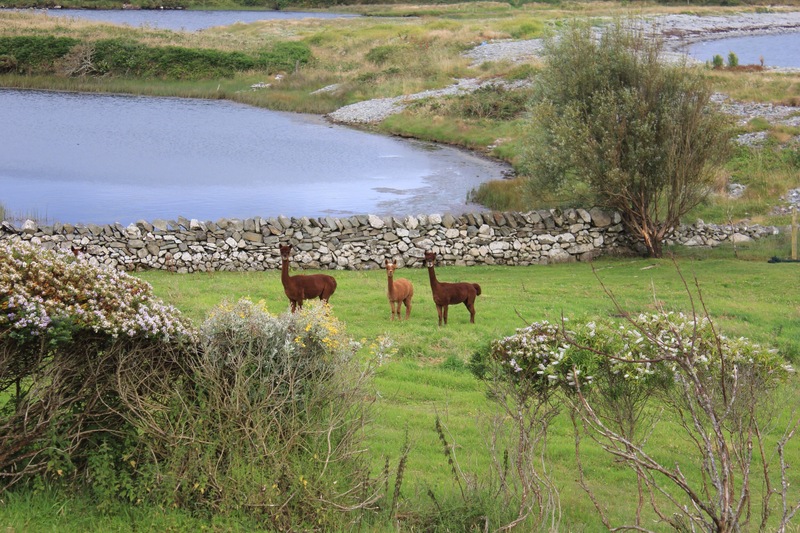 We tried to make friends with the aloof alpacas before setting up the tent. The next morning we set off early and not having time to cycle the full circumference of the long peninsular we head inland towards the steep mountain road known locally as ‘The Goats’ Pass’. Tough but short lived we manage to reach the top and stand a while enjoying the panoramic views while Paddy tells me tales of Fin McCool the giant and his mystical dog… Down we go to the other side and within two hours we have reached the bustling market town of Bantry where a food and craft market is in full swing with musicians playing in the streets and car boot stalls set up all along one side of the square. 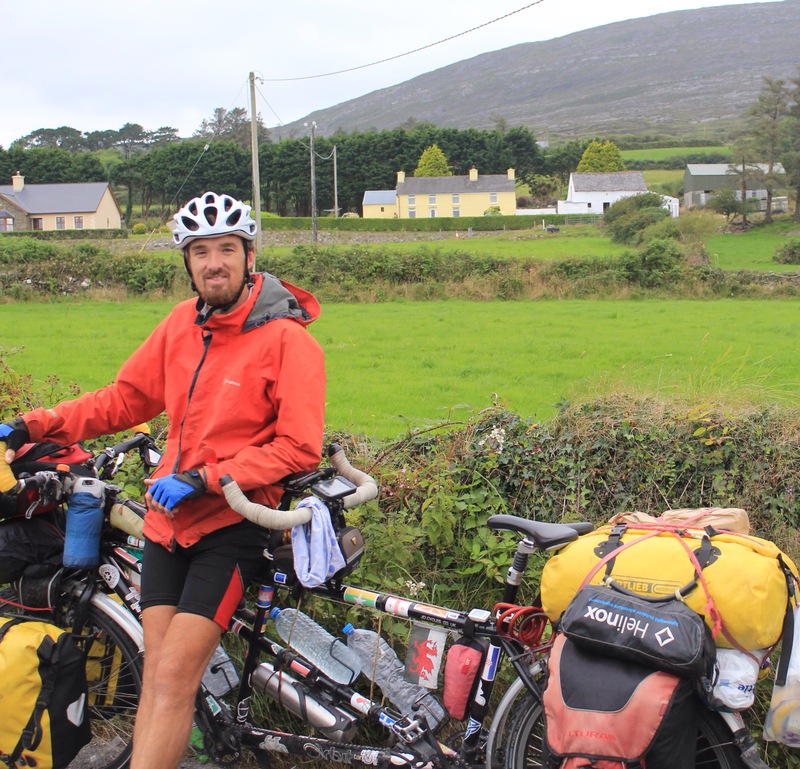 After Bantry we had our first major climb to look forward to which would see us cross into Kerry over the Caha Pass – the road which twists and turns up through the green craggy mountains of the Beara peninsula. 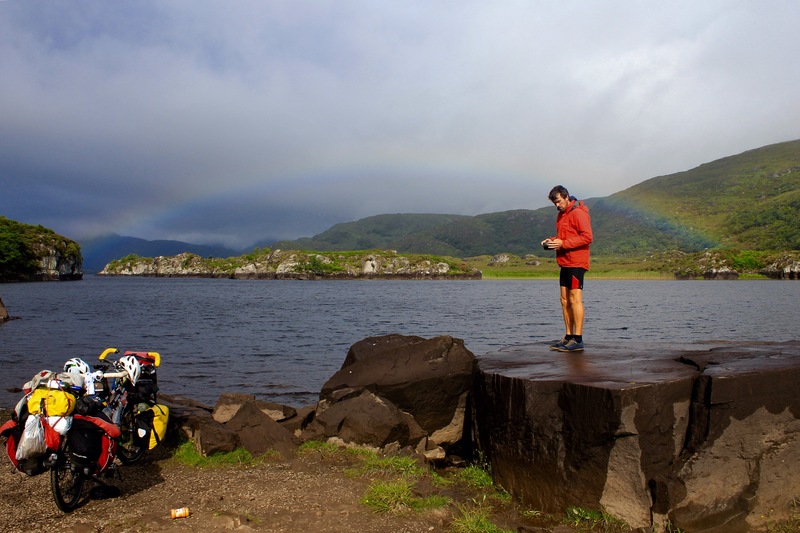 We cycled through the famed tunnels at the top of the pass and soon reach Kenmare which marks the ‘ring of Kerry’ the most trodden tourist route in Ireland. This famous loop will have to wait for another year as we had no plans to cycle it, instead wanting to reach the west coast in this last week. 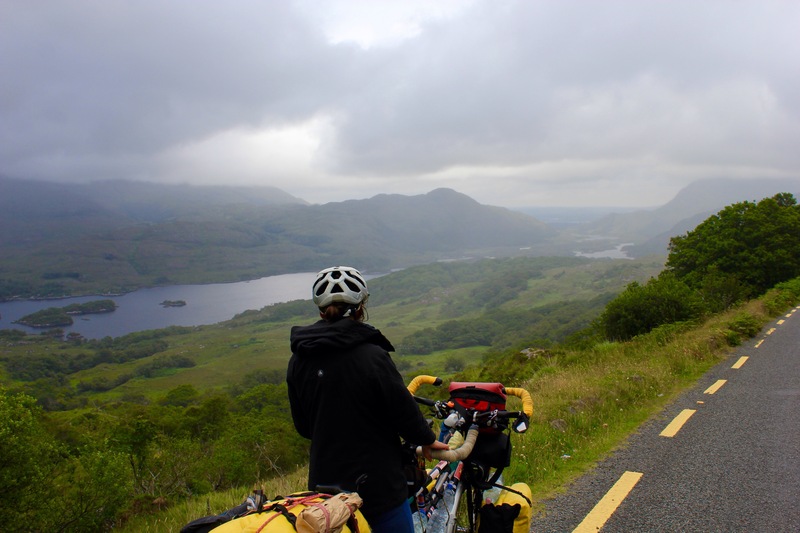 From here we have another 10km climb to Molls gap – which sees us reach the famed Kilarney lakes. By now the weather has rolled in and we look out on a misty landscape below. Caraun Toohil – tallest mountain in Ireland is here too. We contemplate whether the weather at the bottom will be any better but with a stunning view at Ladies View overlooking down towards Mc Gillicuddy reeks (mountain range) we decide to make a very gnarled, twisted old oak tree our home for dinner and we can decide about camping … It’s overhanging mossy branches provide a pretty good umbrella from the misty rain And it’s not until the proper rain really arrives that we start to regret not putting the tent up straight away. We are now forced to erect it in full wet weather which is never fun. In the tent Paddy delves into Irish folklore once again with more stories involving Fiin McCool such as the Salmon of Knowledge tale. 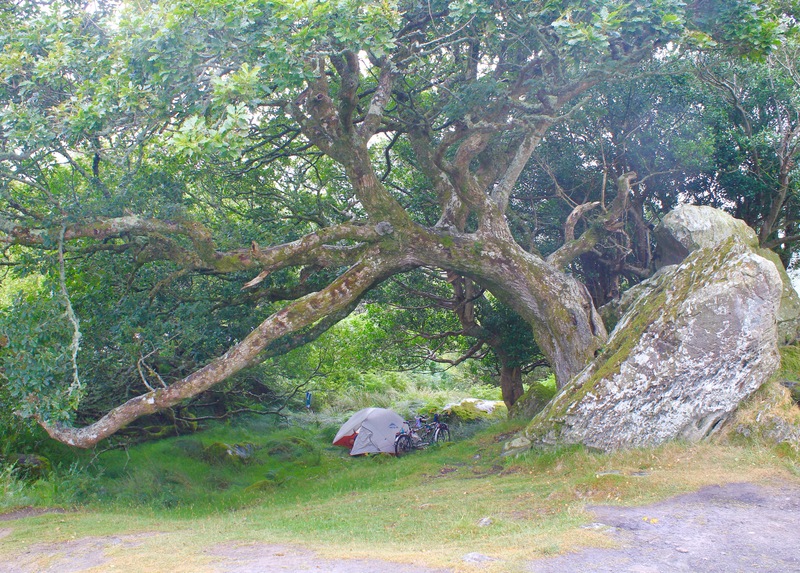 The old oak sheltered us well all night but we woke to more rain and decided to pack up and reach lower ground before attempting breakfast. Too wet to come out! Before long we had reached Mill town – where P’s grandfather, the original Paddy Cronin, was born. 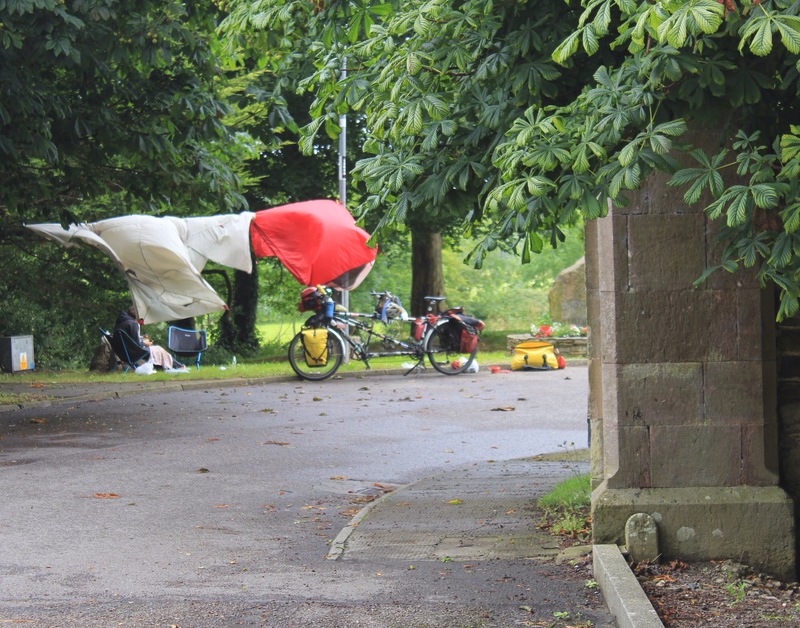 We set up a mini camp on a big grassy park section of the Main Street and used the time to dry our very damp tent. While Paddy was cooking a full fry up I went to get water and unfortunately was met by a very unfriendly pub owner who proceeded to passive aggressively tell me it was extremely presumptuous and rude of me to come and ask for 4 litres of tap water ‘for free’ – didn’t I know the cost of water in Ireland now?? I found the whole thing ironic largely because Irish citizens did for a time start paying for their water but the policy was so unpopular that the government rescinded it a year ago and made it free again!! I wanted to tell him he was the first person ever in 25 counties to refuse us a refill, and ask him what that said about him, but I ended up politely excusing myself instead and the next pub filled them up no questions asked.